I got a fantastic cookbook from my in-laws for my birthday. They were in Portland last week and ended up at a restaurant that was on the PDX Eats list I emailed to them. 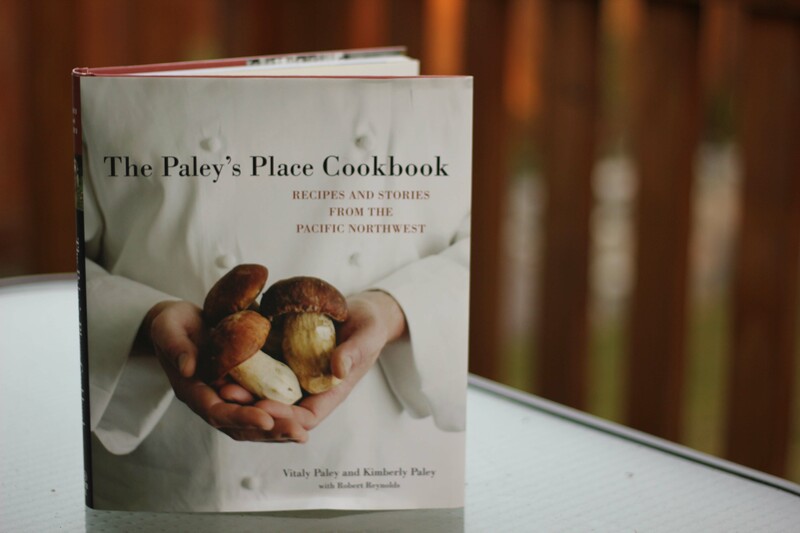 They had a wonderful time at Paley’s Place for dinner one evening and said the food was amazing which made me regret that I didn’t choose to go when we were there a few weeks ago. But I did get this awesome cookbook that not only looks great, but has recipes that are approachable with ingredients that I’m able to find locally. Photo taken with my new 50mm F/1.8 lens, a birthday gift from my parents. There are quite a few recipes that I want to try, but I chose the risotto and salad to tackle for a Monday night dinner. I knew I could prep almost everything in advance so when I got home from dragon boat practice, all that I’d have to do would be to put things together. 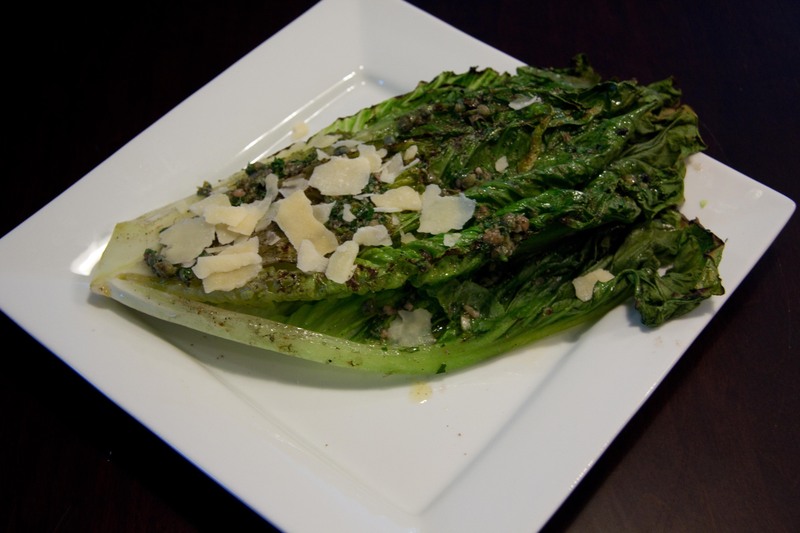 I’m a big fan of grilled romaine. I like that the leaves char and soften on the outside but stays crunchy on the inside. It’s also easy to do as a prepare ahead, because all you have to do is cut the head in half, wash it. I mis en place-d all the rest of the ingredients for the dressing and I left the rest to be assembled at the last moment. My father-in-law claims he has never had a memorable risotto until he tried the one at Paley’s Place. He raved that there was so much flavour infused in the rice. When I read the recipe, I noticed that it used a different method than the most. Instead of adding the broth a little at a time, in this recipe, you dump all the stock in at one, only stirring occasionally after that. Sounded WAY easier, so I thought I’d give it a try. This recipe also called for something else unique; corn broth, which is basically boiled corn husks. I did it and was amazed how much sweet corn flavour there was in the broth. This was a lot of corn & crab, I saved half and put it on top of a salad the next day which was delicious! As I started the risotto, I threw the lettuce on the grill and then dressed it. We had enough time to eat this delightful salad while the risotto was cooking. Mmmm! Capers and anchovies really make this salad. Special thanks to my brother Vince for giving me a grey piece of cardboard for my birthday. As lame as it sounds, its amazing and helps set the white balance fort he photos. Hooray for “perfect” colour from now on! I don’t really rate myself or meals, but for your reference, (and because my father-in-law loves to rate things) I’d give myself and/or the recipe a B+. The risotto ended up not being liquidy enough, and I don’t know if it was the method or if I should have added more stock at the end, (even though I did add half a cup to try to make it more liquidy, it just soaked up). I’ll definitely try this easier method again because it’s really nice not to have to stand over the pan for 20+ minutes, adding stock and continuously stirring. It looks more like a pilaf than it does a risotto. I should have just kept adding stock nevertheless, it did taste quite good. It may be perfect white balance, but now I need to work on lighting. 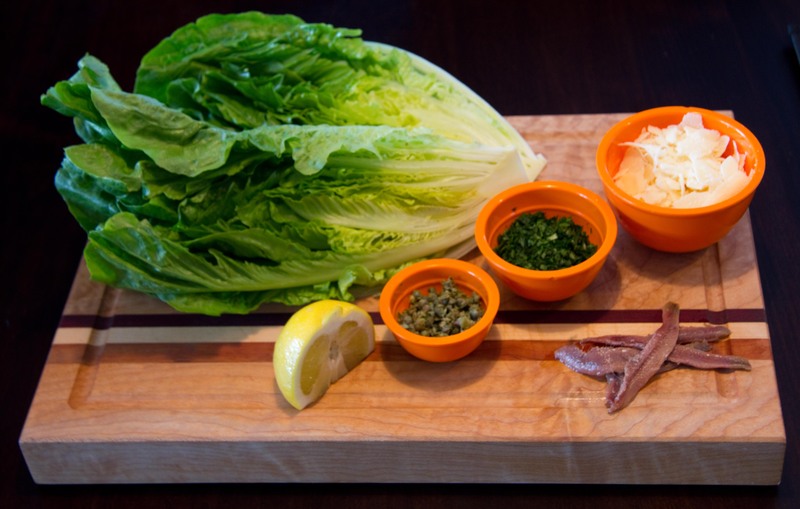 For Vinaigrette – in a small bowl, stir together the anchovy, lemon juice, 6 tbsp olive oil (1 used 3), set aside. Wash lettuce and dry on paper towels. Drizzle with olive oil, S&P and grill until there are grill marks (=30-45 sec/side). Plate lettuce, spoon dressing over and with a vegetable peeler, shave Parmesan ribbons over the lettuce. In a large saucepan, warm olive oil over medium heat. Add onion, S&P, cook without letting the onion colour until pieces are translucent (=3 minutes). Add rice all at once, and stir frequently until rice changes colour (=2 minutes). Increase heat to high, add wine & stir until wine has absorbed (=3 minutes). Pour in 3 cups of broth & boil, stirring occasionally so rice doesn’t stick to the bottom of the pan (= 10 minutes). 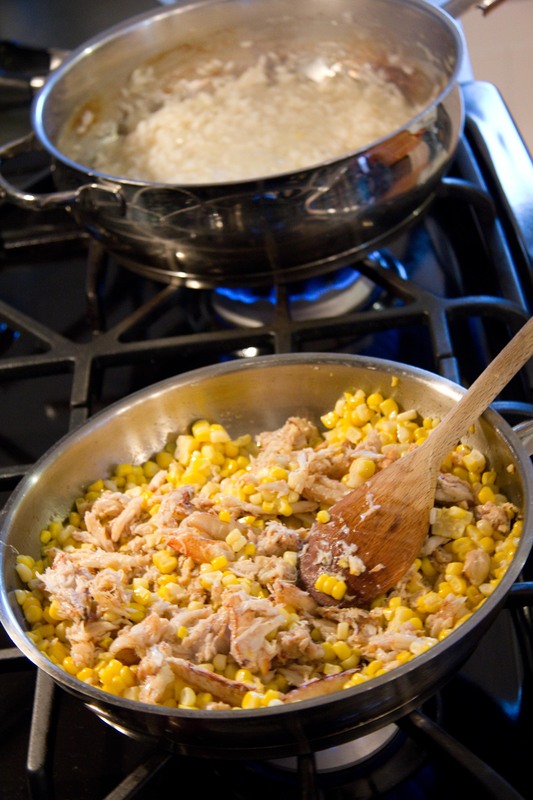 In a small skillet, melt 4tbsp butter, (I used less than 2) – add corn & crab, warm gently (=5 minutes). After 10 minutes, test rice for doneness. The grains should have a little resistance and the risotto still be fairly liquid. 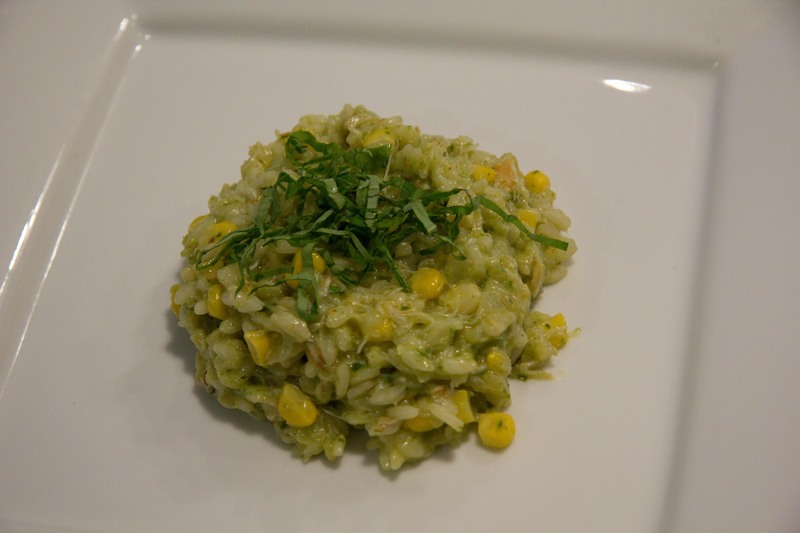 Mix crab-corn mixture into rice & stir (=2 minutes). The risotto should be the consistency of porridge, add more broth if it is dry (I didn’t and mine was more like a rice pilaf than a risotto). Remove pan from the heat add remaining butter, (1 put in a tiny pat) along with 1/2 grated cheese. Stir the risotto vigorously (=1 minute). The resulting texture will be creamy. Stir in the pesto. To serve, garnish with basil and add more Parmesan to taste. Bring water to a boil over high and add corn & salt (=5 minutes). Remove corn and let cool. Slice kernels from the cobs save half for the risotto and half for another use. Halve the stripped cobs and return to the pot of water. Simmer until the broth develops a corn flavour (=45 minutes). Strain and reserve. BASIL PESTO – Awesome thing about this recipe is that it uses hazelnuts and not the insane crazy expensive pine nuts, (have you seen how pine nuts have quadrupled in price in the last 6 months?) Also awesome is that I got to use the Magic Bullet my sister got me for my birthday to make this! In a small skillet, toast the hazelnuts over medium, rolling back and forth until the nuts are evenly coloured, the skins start to peel and give off a toasty aroma (=5 minutes). Transfer to a kitchen towel to cool slightly and rub them in a towel to get rid of as much papery skin as possible. In the bowl of a food processor, (or the BULLET) add all the ingredients minus the olive oil and pulse until coarsely chopped. Season with S&P. Pour in all of the olive oil and process until smooth. Refrigerate covered until ready to use. It’s amazing how easy it is to eat a half a head of lettuce this way! Not only been in my kitchen, but cooked an amazing meal as well!